without knowing what they're named! without knowing the Contact they are linked-to! without knowing where they are stored! Even when all you know is "I just stored that file two days ago! ", or perhaps, "I had that file open last week", the Intelli-Lists Console gets the file you want, even when you don't "know" the file you want. It's your own personal automatic tracking system! Most-Recent Activity: The Intelli-Lists Console tracks user activity in a number of areas, allowing immediate, one-click access to the item[s] from the Console window. Some applications provide a short, limited list of the last few files opened in that application. As GoldVisionPro is file-type-independent, it keeps track of any file that is Stored through GoldVisionPro, and any file that is Launched [opened] through GoldVisionPro. 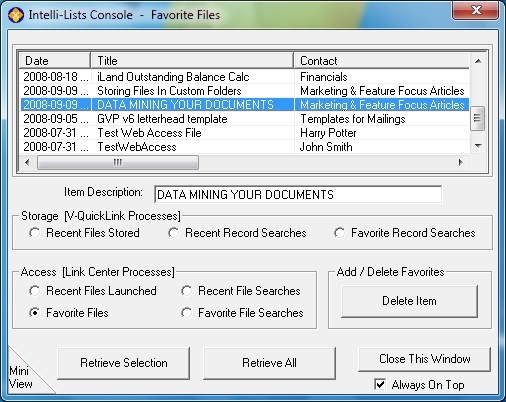 As a broadening of the Recent File activity, GoldVisionPro also tracks the criteria used to find Contacts [Record Searches] that for the file storage process. Likewise, the criteria that was used to find the file link[s] that was Launched is also automatically captured. Retrieve & Open: Users may a select single or multiple items for simultaneous retrieval and display within GoldVisionPro. Alternately, right-clicking the selected item[s] in the active Intelli-Lists Console list will automatically retrieve and launch the items in their appropriate application[s]. Individually Configurable: The Intelli-Lists Console items and settings are individually configurable for each user, and for each item, to fit user needs and preferences.